This was our first time to Anchorage, and since we had so little time, we packed as much in as we could. Buckle up, this is going to be a long post (but totally worth it, in my biased opinion). We picked the best 60 hours to visit Alaska. The weather was perfect with highs in the low 80s and lows in the low 60s. Sunrise was about 5:30 a.m. and the sun set around 10:30 p.m. Add an hour on each end for civil twilight, and we had some long days. 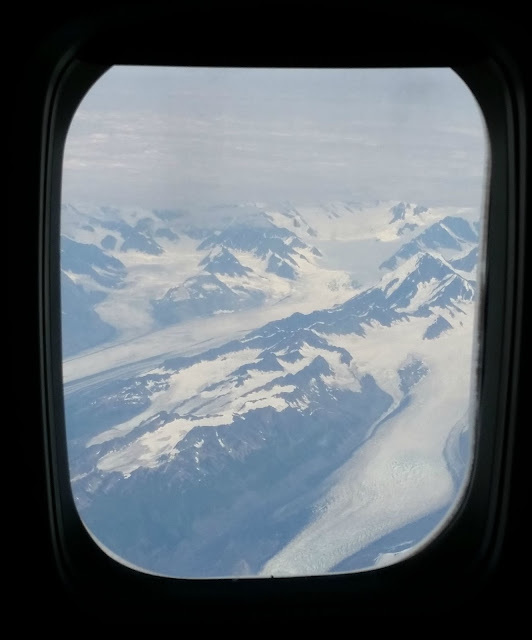 We took the late plane to Anchorage, landing at 1:00 a.m. We picked up a car from National (the hours vary, but they were open when we got there – so maybe check with them?). I’d highly suggest a car rental, unless you’re doing rail or tours that pick you up from your hotel/rental. Because it’s cruise ship season, hotels are a bit more expensive and the options are limited. Most of the downtown hotels were averaging $350/night and the midtown hotels were not much less expensive at about $280/night. We decided to save a few bucks and Airbnb it. We got a great rate on a 2 bedroom rental, just a few blocks walking distance from downtown Anchorage. Our host was super helpful, and also left us breakfast items so we could cook at home after our late night arrival and a bottle of wine so we could unwind. Bonus, the apartment had a raspberry patch with tons of ripe berries and our host encouraged us to pick the berries, too! After we made breakfast in our rental, we headed south on Seward Highway towards Portage (it took us just about an hour to get to Portage). The drive is beautiful, and Highway 1 has a lot of pull-outs so you can safely take a picture of the beauty that surrounds you. We attempted to make a GoPro video of our drive, but our rental car’s dash wasn’t too susceptible to our GoPro suction, so it’s not as awesome as it could have been. We wanted to see a glacier, but didn’t want to pay a few hundred bucks or spend the whole day on a boat. 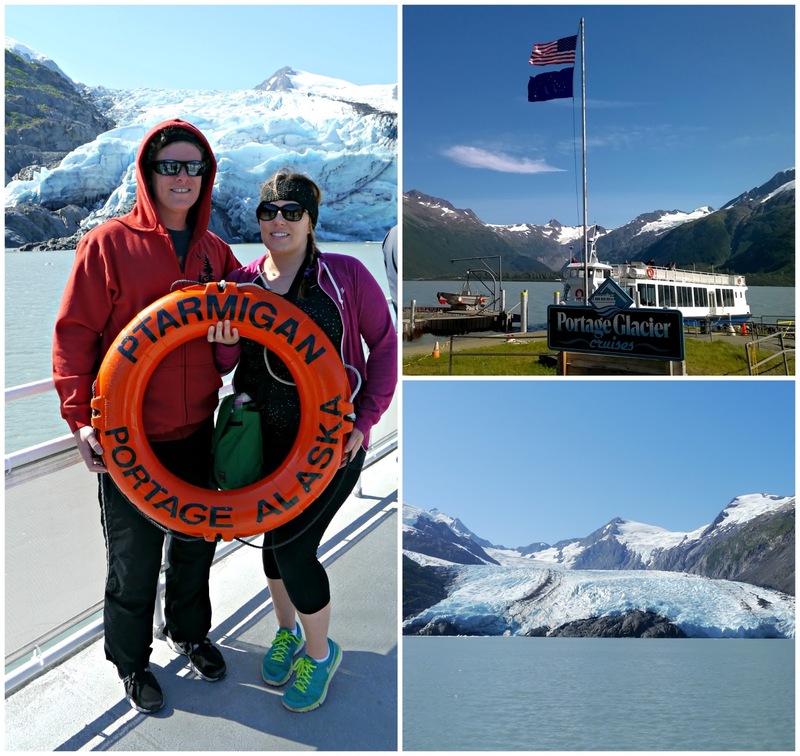 At just $39 per person and only an hour long, the Portage Glacier Cruise on the boat, Ptarmigan, was perfect for us. The hour boat ride was narrated on the ride out by a US Forest Ranger and we learned many facts about the region and the glacier. The second half of the boat tour was quiet, with about 30 minutes spent touring the glacier up close for many photo ops. Portage Lake is a relatively new lake that was formed by the melting glacier. The lake temperature is approximately 34 degrees, as sediment left from the glacier floats in the lake and blocks sunlight from entering the lake. This also is why we didn’t see any wildlife on our cruise, as nothing can live in the lake. The tempature on the boat is a bit chilly, and it’s windy, so bring a coat with you. If you do get cold, the Ptarmigan has loaner jackets for you. To get to Portage Glacier Cruise, take the Seward Highway south. Just after milepost 78, turn left on Portage Glacier Road. Go about 5 miles further to a fork, go right and follow signs for the Portage Glacier Day Lodge. Tours leave five times per day, call for availability and save $5 with this coupon. 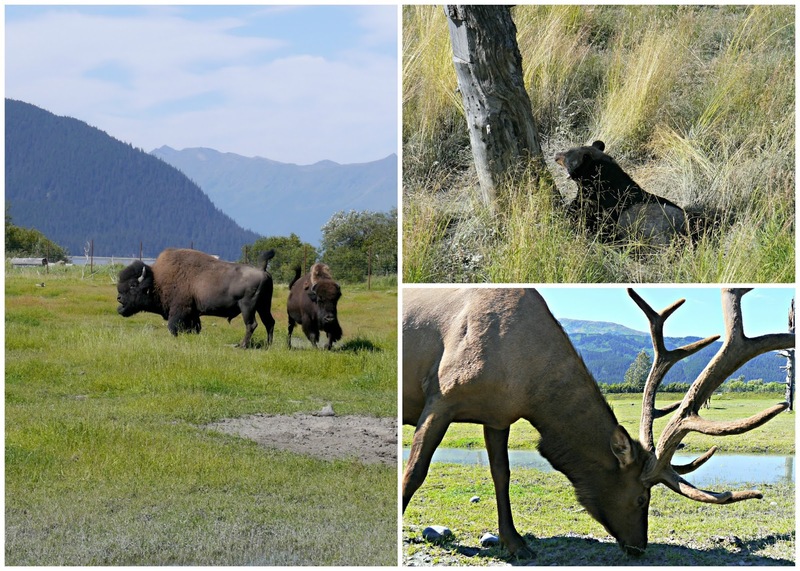 We couldn’t go to Alaska without seeing a moose and a bear, right? So we back tracked about five miles to milepost 79 and arrived at the Alaska Wildlife Conservation Center. The AWCC is a non-profit committed to preserving Alaska’s wildlife. The over 700 acre center takes in orphaned or displaced animals, provides quality care, and then reintroduces the animal back into its natural habitat. Some animals cannot be reintroduced, and they have a forever home at the center. We met many new friends on our journey, including Moose, Elk, Wood Bison, Musk Ox, Bears, Reindeer, and so many more. The natural habitats are very large and the backdrop is absolutely stunning. You can walk through the park, drive your own car, or take a guided tour bus. Entrance fees are $12.50 for adults and $9 for seniors/kids/military. 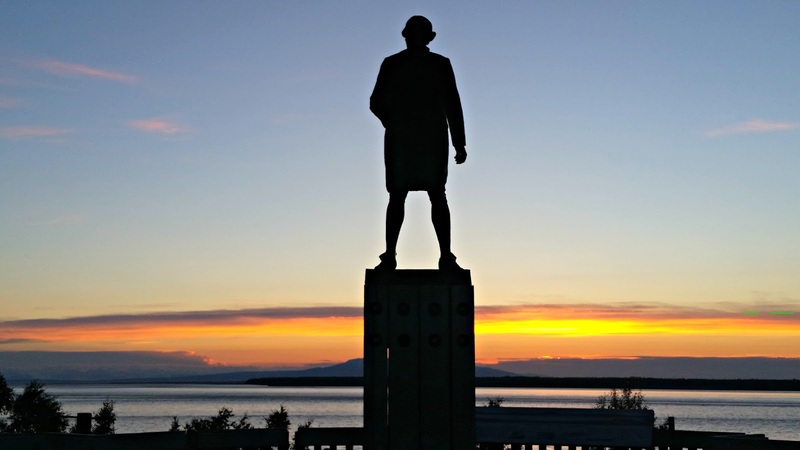 Don’t forget to stop and take in the beautiful sites, and look out at the end of Turnagain Arm. Heading north on Highway 1 back towards Anchorage, you’ll come up to the town of Girdwood and Alyeska Resort. Turn right on Alyeska Highway, drive a few miles and you’ll see Girdwood. It was lunch time and we were hungry. 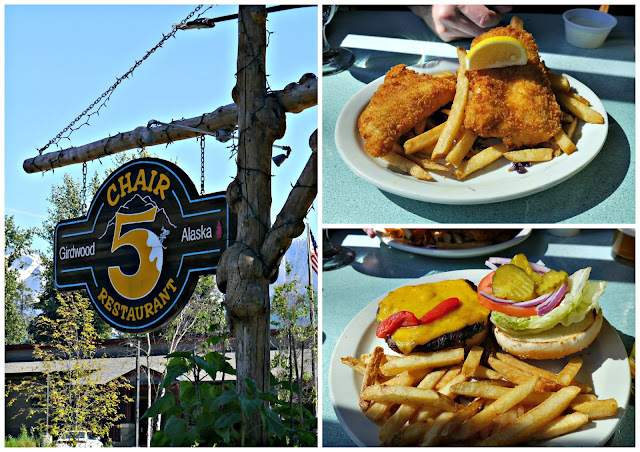 Chair 5 has pub food and a lot of beer on tap – something like 60 beers and 40 tequilas. It’d be a great place to stop after a nice hike, too. We did it backward and got lunch and a beer before our hike. Chad got the halibut fish and chips (it was so good!) and I chose the elk burger (also good!). The views from the restaurant are pretty spectacular, too. I love waterfalls, I always have. I especially love easy hikes to waterfalls so you can see many in a day. The hike to Virgin Creek Falls takes about 10 minutes and is fairly easy. It’s not until you reach the falls that there is a big drop on the trail (maybe a 4 foot drop) but has some rocks to help you get up and down. At the bottom of the trail, at the falls, is a big rock where you can sit for a minute and put your toes in the water. Getting to Virgin Creek Falls is fairly easy. Just past the town of Girdwood, but before you get to the resort, turn right on Timberline Drive (which eventually turns into a dirt road). Follow it until it ends and park in the turnaround, but don’t block a driveway. You’ll see a small sign at the trail head. 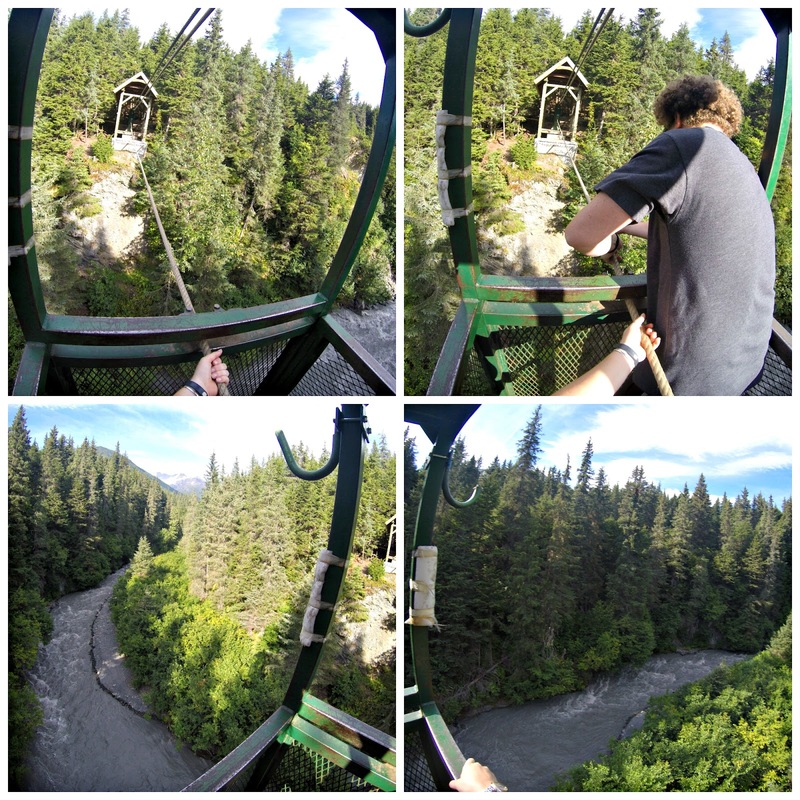 OK, so this was one of the coolest things we did in Anchorage. The Winner Creek Trail starts at the Aleyska Ski Resort, behind the Tram (you’ll see signs). 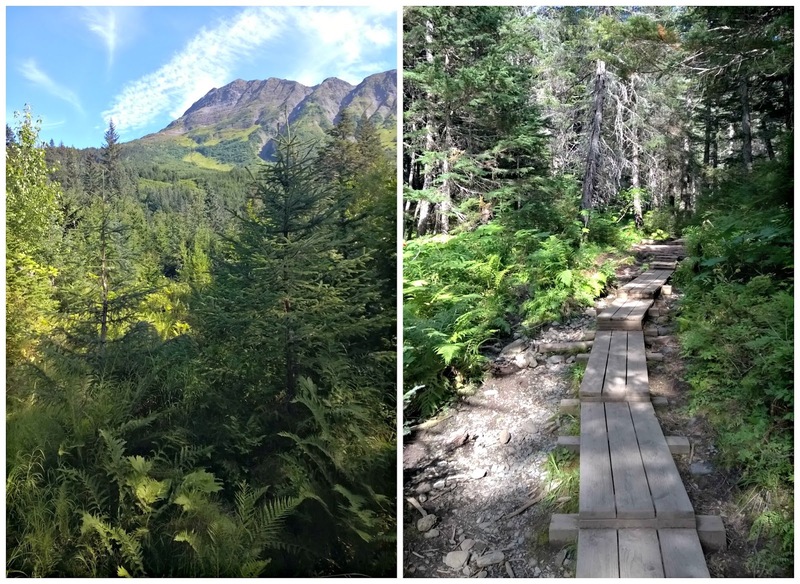 While the whole trail is well maintained, the first half mile is mostly flat and has a raised boardwalk to keep you out of the mud. The trail is in a lush rainforest and you’ll see many ferns, devil’s club, and mushrooms. The lack of elevation change also makes this a pretty easy trail. About 1.5 miles in, you’ll get to a fork. 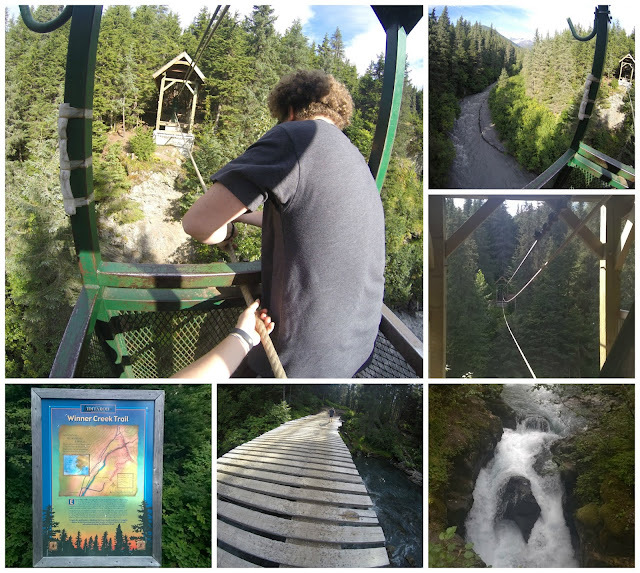 Go left for Winner Creek Falls and the hand tram (going right leads you to Upper Winner Creek). Follow the trail for another .75 miles and you’ll arrive at a bridge over Winner Creek Falls. Before you come to the falls, you will come to a wide bridge on your right that leads to another trail. I don’t know where that trail goes (and it’s not well maintained) but crossing the bridge is kind of cool. And after your done crossing a bridge for no reason, and crossing it back for no reason, walk a bit further to see Winner Creek Falls. If you look to the other side, you’ll see a nice blue pool of water (which I caught with my GoPro) and maybe even a few people panning for gold. Now, just about .3 miles further you’ll come up to the hand tram, which connects the trail over the gorge. I can’t do it justice with words, so just watch the video. I will tell you, it’s high up and not for the faint of heart. It was both terrifying and exhilarating at the same time. Also, I should point out, I’m terrified of heights. Here are a couple stills I pulled from the Go Pro. After riding the hand tram, we headed back to the resort and to the car. All in all the hike took us about 2 hours total. 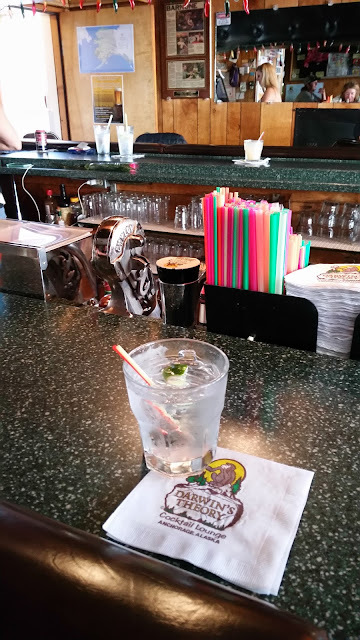 After getting back to the resort, you could stop and have a drink or even take the aerial tram to the top of the mountain. If you want to skip the hike and just go on the hand tram, there is a way to go from Crow Creek and it’s a quick 30-minute hike to the tram and waterfall. Also, if you’re at Crow Creek, you can pan for gold. Heading back to Anchorage, we stopped at mile marker 109 to fill up our water bottles with fresh mountain spring water. Is it safe, you may ask? Well, I did some internet research; it’s been independently tested. The water is high in alkaline and has high amounts of magnesium and calcium, but is otherwise safe. 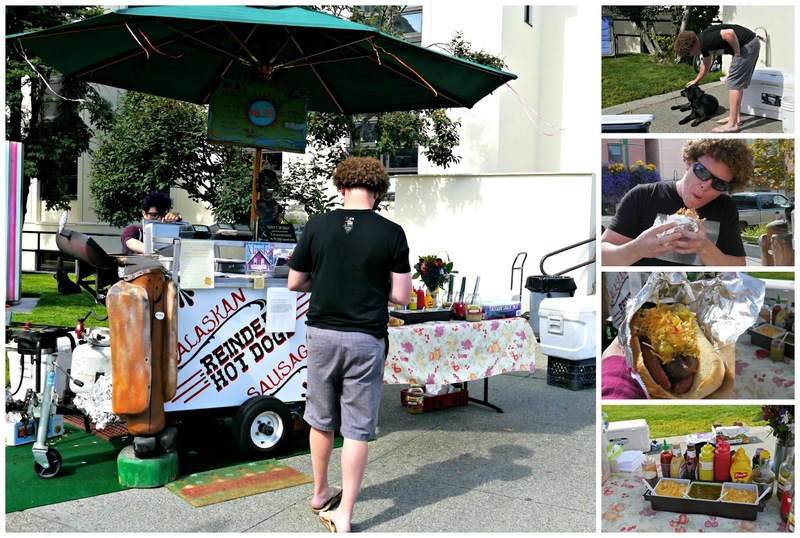 It was pretty tasty, too, and some locals swear by it. We had to wait a minute behind people that were literally filling up jugs and jugs of water. There is a pull out on the south shoulder across from the pipe. If you’re coming from Anchorage, it’s just south of Beluga Point. Look for the cars and the people carrying large blue jugs across the street. We headed back to the Airbnb to shower and change and get ready for dinner. Our first stop was Orso, just a few blocks from our rental. It was happy hour from 9:00 p.m. to close – which happy hour in Alaska isn’t like happy hour everywhere else. Due to a state law, they can’t discount drinks for certain periods of times, the drink must be discounted all day. However, food was still discounted. We had the crispy cauliflower, seafood verde, and the calamari. OK, the calamari is soaked in buttermilk and it was delicious. I’d highly recommend it. Next we went a few blocks away to Humpy’s to grab another little bite and a drink. 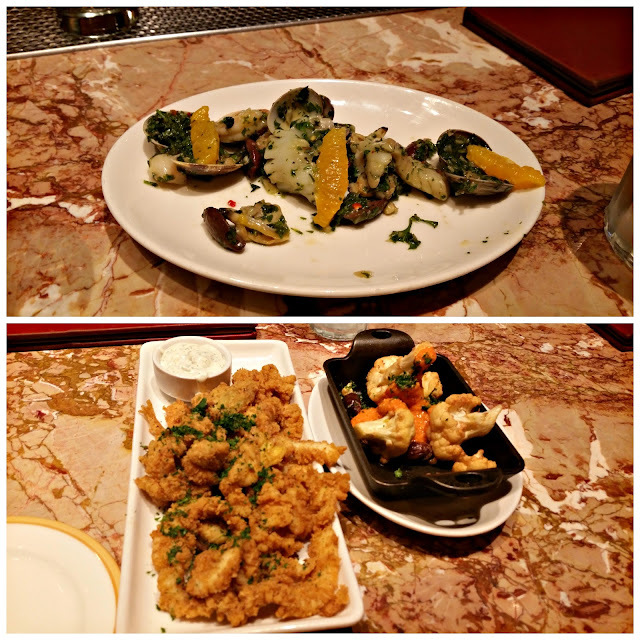 We went with the seafood duo – smoked salmon and smoked halibut and a caesar salad. Both were really tasty and the drinks were well poured. They also have a lot of beers on draft, with many of the choices being from the great state of Alaska. We also met some local guys that we ended up chatting with a bit about life in Alaska and if it was hard to get used to the midnight sun, and the winter darkness. The general consensus from them was that Alaska was the best place to live ever. 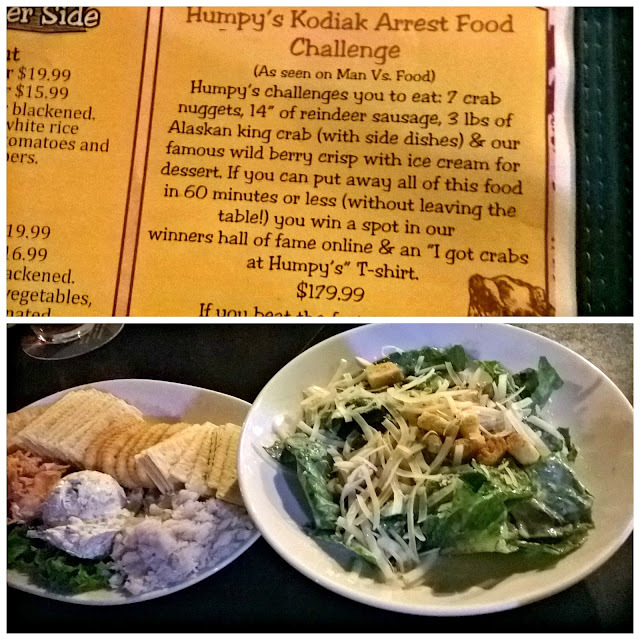 Also, if you’re an eater, check out the Humpy’s Kodiak Arrest Food Challenge. We slept in a little bit and made breakfast at the apartment again. After we relaxed a little and had a slow morning, we headed on North Glenn Highway to Eklunta. Mirror Lake is at mile marker 23 and the road is marked. Get off the freeway and follow the signs and you’ll come to a small park with picnic tables, a grill, and bathrooms. Not only is Mirror Lake beautiful, but it’s apparently stocked with Chinook salmon. We put our feet in the water and I was bummed that I didn’t bring a suit. The water was actually quite warm, so I just waded instead. We got back on North Glenn Highway, heading north, to Eklunta Village. Go straight and on your left is the historical park. It’s hard to miss, I think this tiny town has one road. 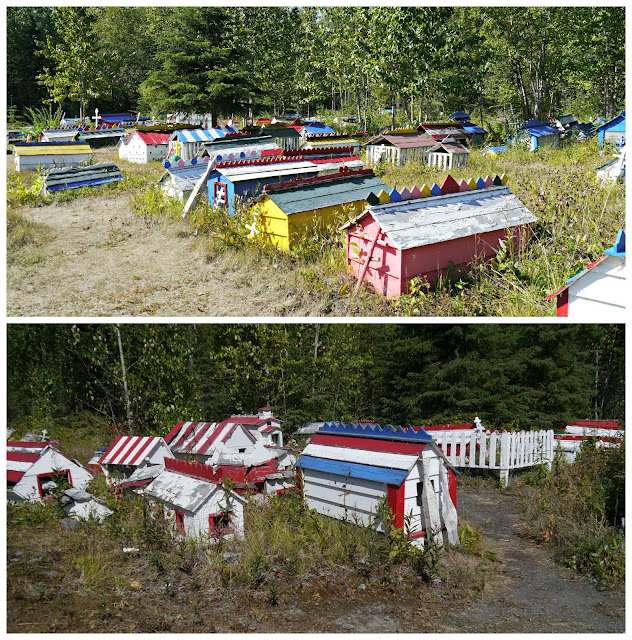 Eklutna is a Dena’ina Native village, and Dena’ina natives are Athabaskans. In the mid 1800s, Russian Orthodox missionaries came to Alaska and the Dena’ina started to convert. Before converting, the Dena’ina used to actually cremate their loved ones, but that’s against the values of the Orthodox Church. So, the Dena’ina needed a place for the spirits to go after death and that is how the spirit house came about. According to Athabaskan tradition, 40 days after a person has passed, the family places a spirit house on their grave to house the deceased spirit. Head into the gift shop to pay the $5 entry fee. You can take a self guided tour or take a tour with the guide. For more info, listen to the NPR segment on the spirit houses. Eklunta Lake is the largest lake in the Chugach, and actually provides drinking water to the city of Anchorage. We put our feet in and the lake was cold, but not unbearable. There were a few children swimming on the shore and seemed to enjoy the chilly water. I also think this would be a great place for a kite, as it was very windy. Lakeside Trail is a flat hike on a paved road. As the name suggest, it follows the lake for about 10 miles. 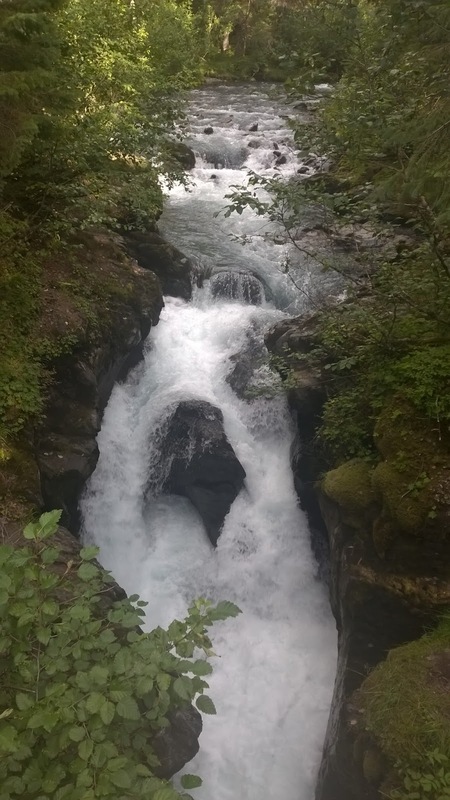 You can keep going on more primitive trails where you will see waterfalls, and you can even view a glacier. If you want to kayak the lake or bike the trail, Lifetime Adventures has kayaks for rent (though it might be a good idea to reserve the boats and bikes in advance). They also have a package where you can kayak to on side of the lake and bike back to your starting point. It takes about 5 hours and you’ll need to start by 11am. Do a little searching for coupons to get 2 for 1 rentals, like this one. And one more from the lake. It looks like we are in front of a green screen and the background is just dropped in. Alaska is so beautiful. While you’ll find many dog stands within the tourist section of 4th Avenue, we heard M.A.’s was the go-to place for our Reindeer street meat. Our dogs came out perfectly grilled (reindeer is too lean on its own, so it’s mixed with other meat) and tops with grilled onions. There was a plethora of condiments to choose from: shredded cheese, onions, peppers, pickles, relish (both dill and sweet! ), and many toppings. I really liked the M.A.’s homemade sweet and spicy sauce. Chad liked the spicy pineapple sauce. If eating Rudolph isn’t your thing, they also have a bunch of other types of dogs like brats, hot links, beef dogs, etc. The dogs are $6.25 each and M.A.’s is cash only. The stand’s staff are a little snarky in a fun way (when asked if we wanted grilled onions, we both said yes and were thanks for being adults that order onions). They also keep track of walk-aways and ask people to guess how many people will walk away, and their shirt says “Doing it Doggy-style on 4th Avenue.” Bonus – they have a dog that just chills by the cart. 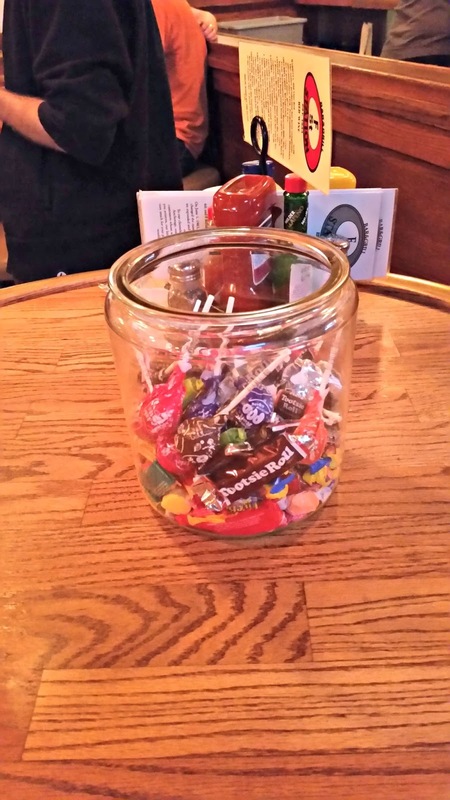 Also, check out M.A.’s Facebook page for updates on closures, specials, and general snark. Look at my reindeer dog of goodness…. After our dogs, it was back to the rental to chill and (for me) take a quick catnap. After we were well rested, we ventured downtown and our first stop (of many stops this night) was at The Bubbly Mermaid. 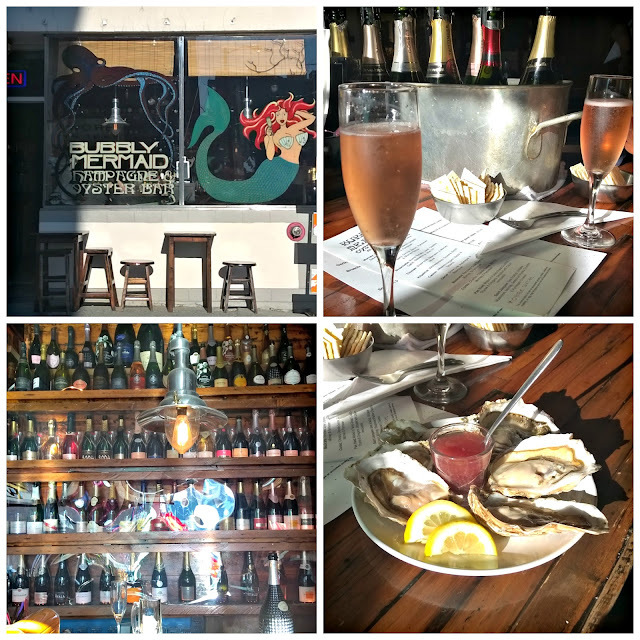 The Bubbly Mermaid is pretty much an oyster and champagne bar – which are two of my favorite things ever. 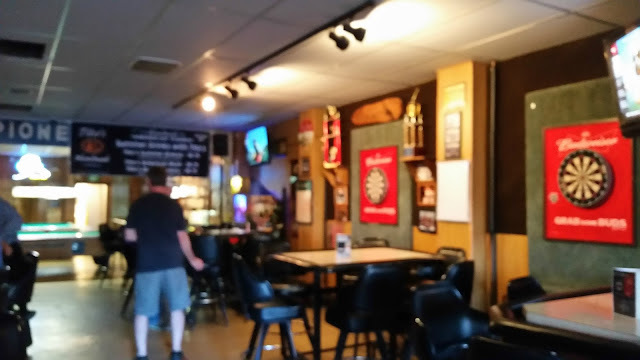 Darwin’s Theory is a great little dive bar, we loved it. First, everyone was really friendly or maybe just drunk, but whatever. Some lady next to Chad was showing him pictures on her iPad of her trip to Seattle and talking to him about who knows what else. The guy next to me showed me a stack of pictures he took and tried to sell them to me for $20 to take back to Seattle as a keep-sake. The guy behind us was telling us some gossip about the people talking to us. Just all around fun and welcoming. Darwin (the owner) is apparently the world’s biggest seller of cinnamon schnapps and the website says to go to the Heavy Petting Zoo in the backroom. We actually never found out what that meant, and I think I’m OK with that. 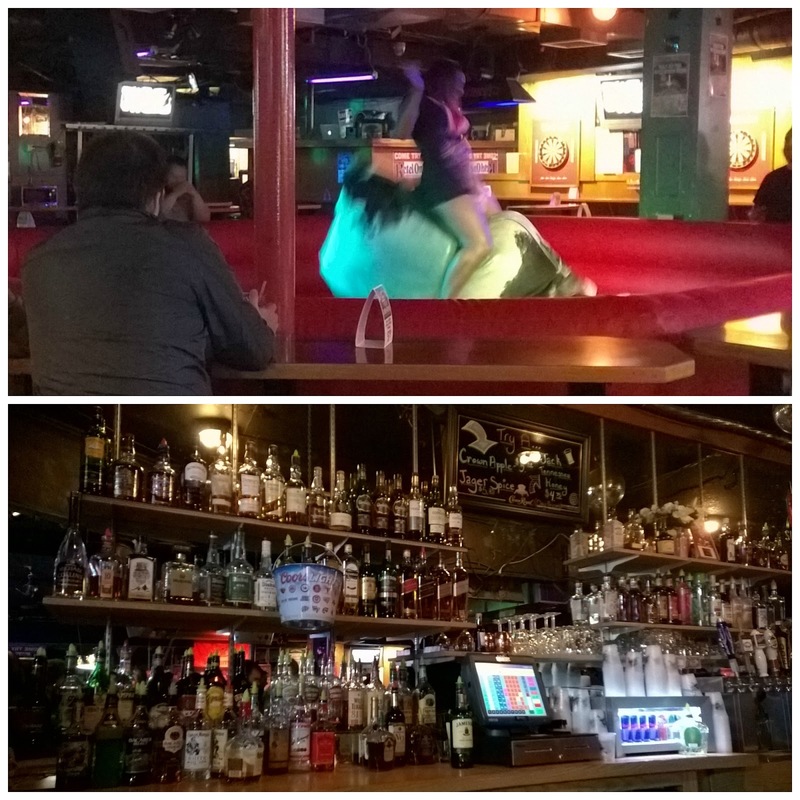 Sticking with the theme of dive bars, next stop was just a few blocks away at Pioneer Bar. Again, everyone was so nice to us! We chatted with locals and enjoyed our cheap (strong pours here!) wells, and watched some guys play darts. Then, all of a sudden, a Jägermeister shot was placed in front of us. The reps were in the bar, and bought a round for the bar. I blame that shot for the poor photo quality above. It was about 9:00 p.m. now (but with the sun shining it felt like 4:00 p.m.) and after that shot, we needed food. Artic Sushi was across the street, and it was definitely not a scheduled stop. The inside was like rustic Alaska meets zen Japan. We sat at a tall table near the window, and the stools were just a little too short for the table, making us feel like we needed a booster seat. I drank only water at this stop and Chad had a beer. We ordered a spicy tuna roll wrapped in sashimi and salmon sashimi. 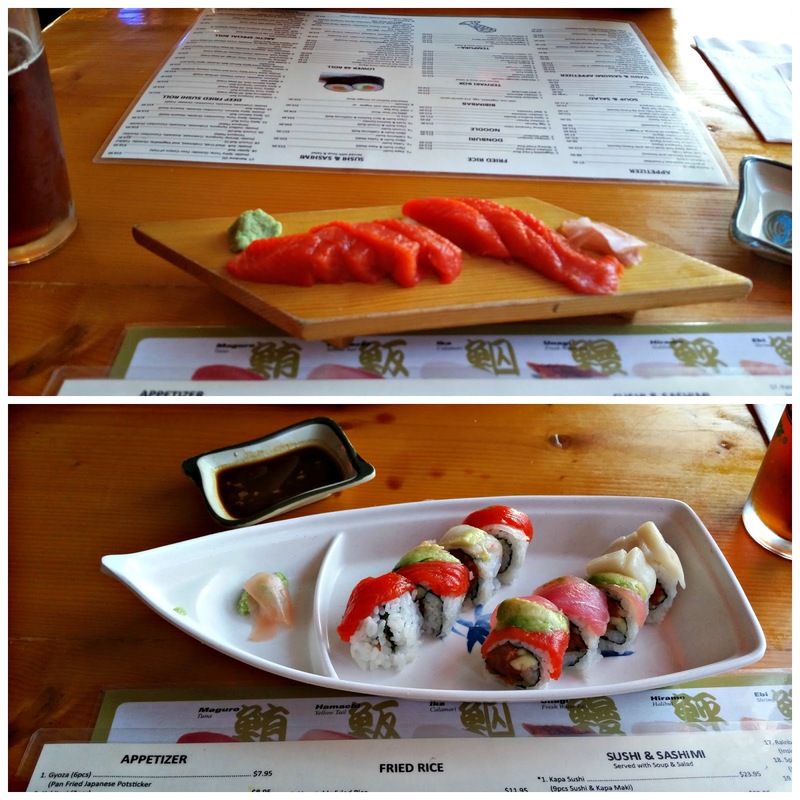 Artic Sushi was alright, but it was kind of expensive (even for Alaska standards), Also, the menu has a “Lower 48” roll section, which I found funny because the Alaska roll section wasn’t much different. We heard Simon & Seafort’s had a great view of the sunset, and at about 10:00 p.m., it was sunset-ish time. We headed to the bar for happy hour and picked a table right by the window, overlooking the Cook Inlet. We ended up skipping the happy hour eats and instead splitting one of the specials. 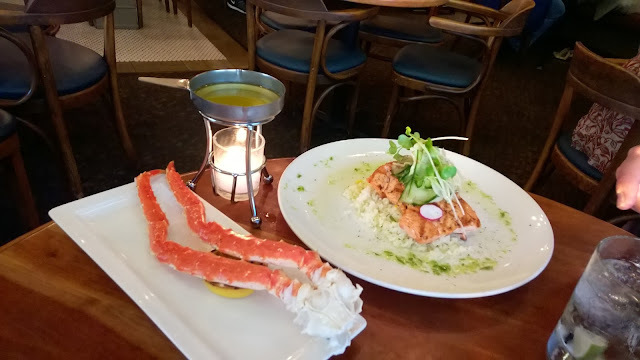 We chose salmon over rice with a pickled cucumber salad (and other greens) and added 1/2 pound of the local Norton Sound king crab legs, which arrived by boat that morning. The crab was absolutely delicious, very sweet and we didn’t even use the butter. I also had a basil gimlet that was on happy hour for the evening and pretty good, while Chad just had a well drink. Overall the food was good, and what you’d expect from a nicer restaurant with a view. It was 10:50 p.m. when we headed just a block north to Resolution Park. The sun was just starting to set and the park has a beautiful view of the Inlet and also a big statue of Captain Cook. This park has a deck with stairs so you can go on lower levels for different views, or all the way down to the tidal flats if you want. The park also has markings so you know what you’re looking at across the Inlet. It was actually pretty romantic to watch the sunset at 11:00 p.m.
F Street Station seems like the type of bar I’d hang if I lived in Anchorage. When we first sat down, were greeted with a candy dish at our table. Drinks took a little time, but the bartender was super apologetic and ended up buying one of our drinks. They also have a giant chunk of Tillamook Sharp Cheddar on the bar next to crackers, so you can make yourself little cheese and cracker snacks. We were joined at our table by some people that happened to just move to Seattle and their friend that moved to Anchorage. We sat and chatted with them a bit, and had a few more drinks. They also made cracker and cheese stacks, but we were so full we didn’t eat any (though, I admit, we did eat candy galore). We heard The Gaslight doesn’t pick up until after midnight, so we got there about 12:30 a.m. It wasn’t too busy and we got a seat at the bar. There were a few people dancing on the dance floor, and every few minutes someone would ride the bull in the middle of the room (complete with seats and a bar around the bull for ample viewing). The drinks were good and our bartender was super nice. We were exhausted from cramming everything into our 60 hour trip, so after a one and done at The Gaslight, we walked home and headed to bed. We tried to go to breakfast at Snow City Cafe at about 9:45 a.m., but so did everyone else in Anchorage. The wait was 90 minutes to two hours for the two of us, and we had a plane to catch. Plus, who waits 90 minutes for breakfast? (If you did want to wait, bring a book and head across the street to Resolution Park, or drink coffee at the picnic tables outside Snow City). Peggy’s Airport Cafe is what you think of when someone mentions an old school diner, complete with cakes and pies rotating in the glass case refrigerator. We remembered passing Peggy’s on the way back from Eklunta the day before, looked up a review, and figured it was a safe bet. We took seats at the counter and despite many other people in the restaurant, were promptly served and our food came out quickly. I felt like this place was very local, as everyone seemed to know one another. We overhead some interesting conversations here about fishing, working the docs, etc. It was great, we loved it. 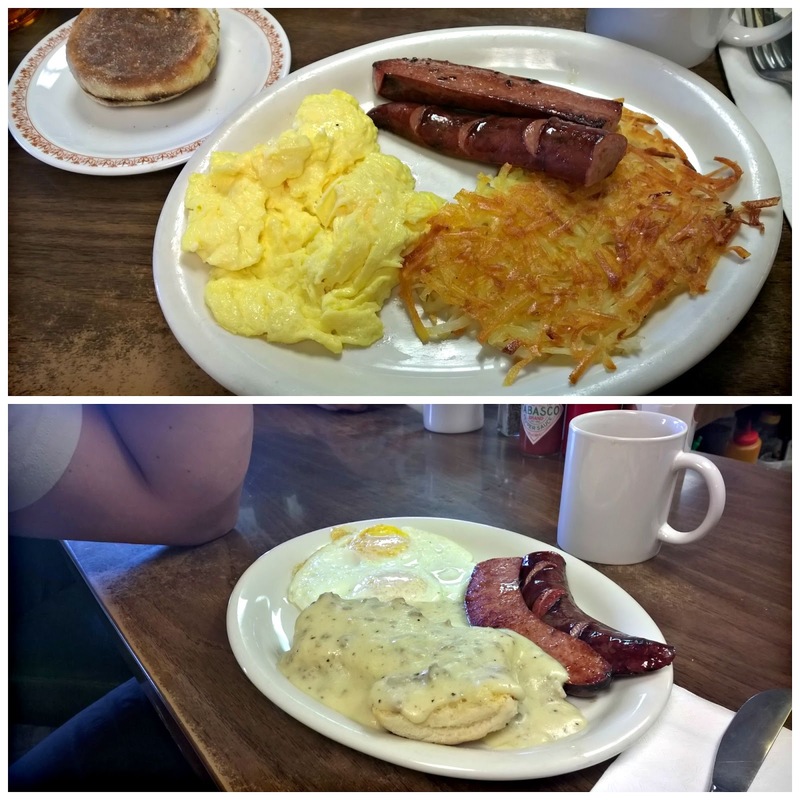 I ordered a typical two egg breakfast, but with reindeer sausage! Chad got the biscuits and gravy with, you guessed it, reindeer sausage! The food was actually great and the reindeer sausage they use is delicious. Just a few miles south of the airport is Kincaid Park. 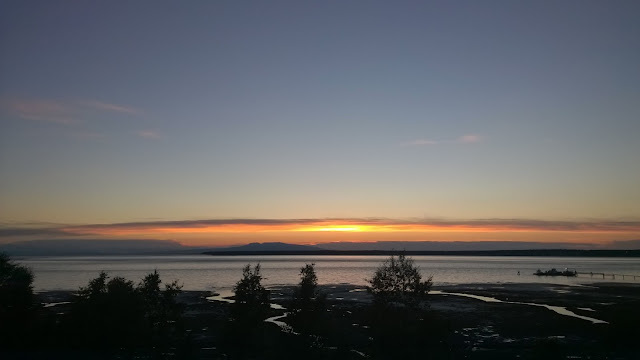 We had an hour to kill before heading to our flight, so we went to the park to see the views of Cook Inlet, and to watch the planes fly in (and let’s be honest, to hopefully, randomly see a moose because rumor has it they hang out here). This park is huge and has many trails and I was wishing we had more time to explore it a bit. It was nice to stretch the legs a bit before our 3.5 hour flight back to Seattle. 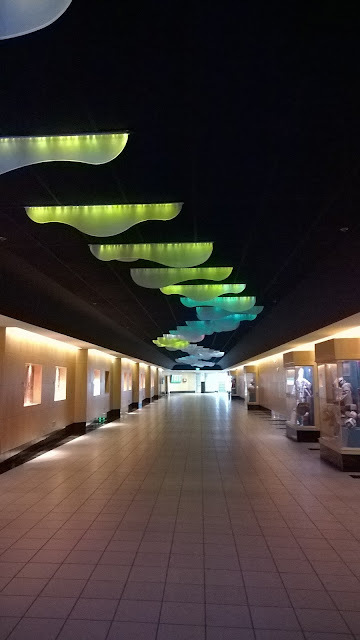 I actually really liked this airport. First, you walk through a trippy cloud tunnel. Then you’re greeted with stuffed wood bison, bears, a moose statue, more wildlife. And then, in our case, our airport journey ended at Humpy’s (yes, like the one downtown) across from our gate. People in Anchorage, in our experience, we really nice and friendly towards us. We had some great chats and shared good drinks with locals. We also noticed people were polite. One example we laughed at was a whole group of kids skateboarding down F Street thanked us for moving to one side of the sidewalk so they could skate by. Directions are often given by milepost and not by streets. It’s actually pretty easy, just look for the green mile post signs. Cell phones work in most urban places, but we had issues with service (both AT&T and Verizon) on our hikes and in Portage. Don’t rely on your phone for directions. Another thing – everyone loved Chad’s afro. He must have had ten different people come up to him or yell “Nice Fro” from across the street. We loved our time here and we can’t wait to go back. We’re hoping our next trip will be train hopping on The Alaska Railroad. 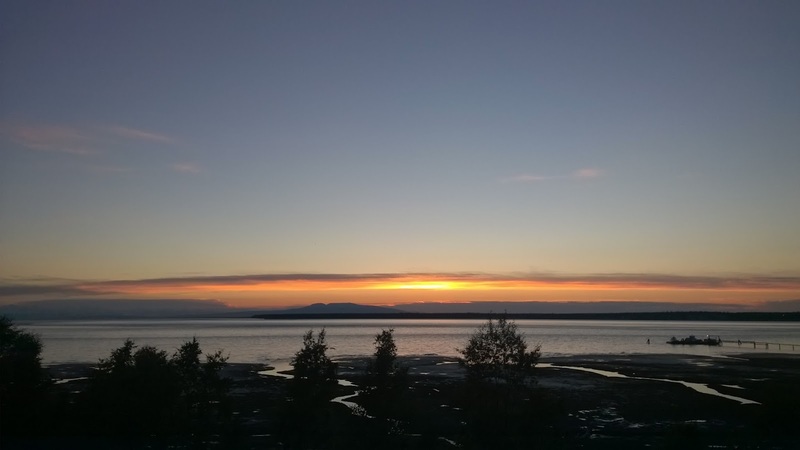 Do you love Anchorage? What is your Anchorage must see or do? Let me know in the comments below, send me a Tweet, or comment on Facebook.